Today, we are launching membership – you can be a part of the movement we need, and get a say in it. Be a member of the movement we need – and have a democratic say in what we do. Another Europe Is Possible was set up in 2016 to campaign against Brexit explicitly from the left. After the referendum, we didn’t give up. We have continued fighting for solidarity between people and across borders – for free movement, social justice and democracy in society. Over the last few months, we have grown massively, undertaking bold projects and shifting the Brexit debate. 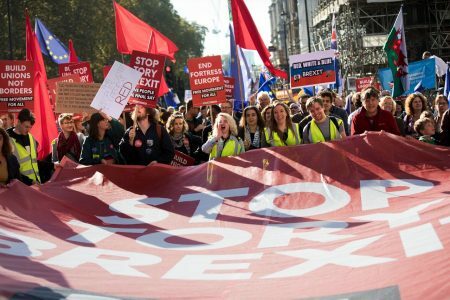 We organised our biggest ever speaker tour, The Left Against Brexit. We influenced Labour’s policy through an unprecedented intervention at Labour conference. We played a key role in organising Stop Trump, one of the biggest demonstrations Britain has seen this decade. Now we’re busy building local groups across the UK, going out onto high streets and into communities, and convincing people that stopping Tory Brexit is both possible and necessary. We cannot underestimate the challenge still ahead of us. The next few months will decide what our society looks like, and what our lives are like, for decades. If we lose, the Brexit project will mean an unprecedented attack on workers, migrants, the environment and human rights. If we win, we can transform Britain and Europe, and win a society built on internationalism and solidarity. This moment is too important for you not to have a say. To succeed, we need the energy, ideas and collective wisdom of our supporters. We want to build a radical, democratic movement – and you should be a part of it. Joining Another Europe will give you a say in how we are run, what campaigns we do and what our strategy is. You will also be able to stand and vote in internal elections. We will be holding a members’ conference on December 8th in London – save the date now.